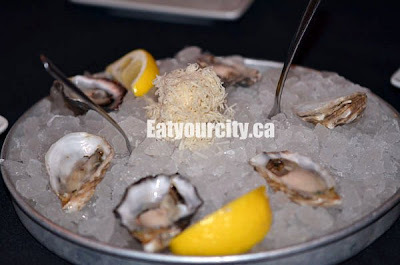 Eat Your City: Von's Steakhouse & Oyster Bar, Edmonton Ab - Consistently great steaks and fresh oysters! For my boyfriend's bday, we rounded up the usual suspects and headed to Von's for a night of drinks, awesome friends, great steaks and yummy oysters. We missed the "Shuck-a-buck" which for those interested is a selection of their oysters for $1 each that runs M-F 4:30-6:30pm, Fridays after 10pm and all day Sunday. There is free parking in the Impark next to the restaurant - just pay, plunk your ticket on the dash and the hostess will reimburse you. Lots of dark woods, red velvet curtains and gold accents in this dimly lit restaurant. We didn't snag their private rooms this time around (less noisy and great for large groups), but headed upstairs - pretty noisy as we were seated beside another large boisterous table. Service is sometimes inconsistent, but we had two friendly waiters tonight. A crisp thick cut piece of bacon instead of pickled veges or a boring piece of celery in my caesar? Sold! 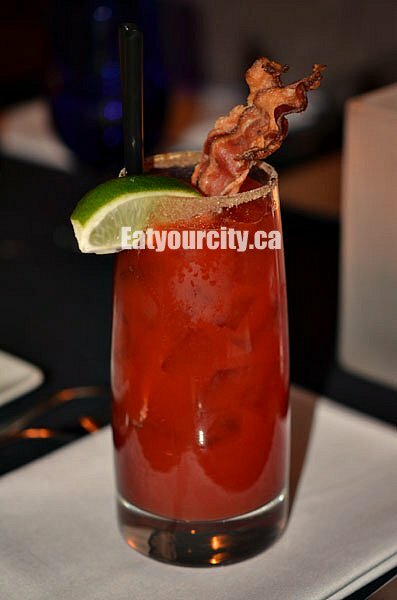 Sadly, the crispy piece of bacon lightly coated in Smirnoff Vodka and Motts Clamato juice was the best part. The drink, though we had asked for our Caesars to be made mild, we still had to ask for the tobasco bottle as the caesar was quite bland, and very tempted to ask for the bottle of Worcestershire sauce too. The awesome bacon slice almost made up for the bland cesear. Almost. This consistently remains a tasty fav. 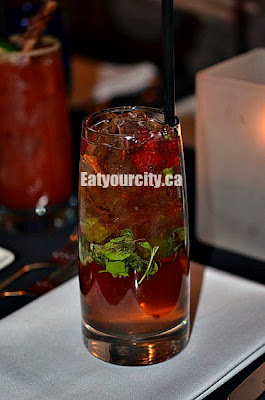 Smirnoff Raspberry Vodka, fresh raspberries, gingerale, and iced tea is sweetened to a not too sweet, not too tart with simple syrup. Refreshing especially with the fresh mint leaves muddled in there. 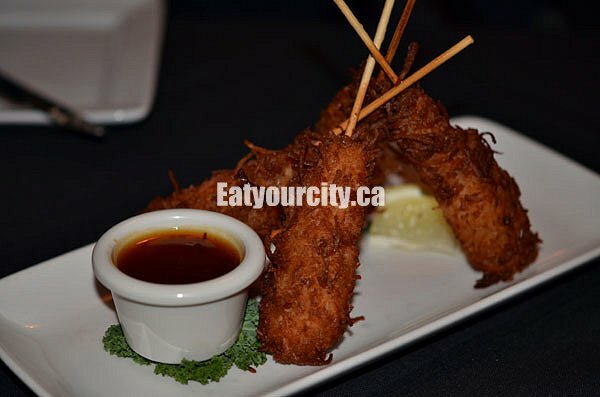 These coconut shaving encrusted tempura battered large crisp shrimp are served with a sweet and spicy plum dip. They were a bit over fried - dark brown rather than a nice golden brown, but still tasty. 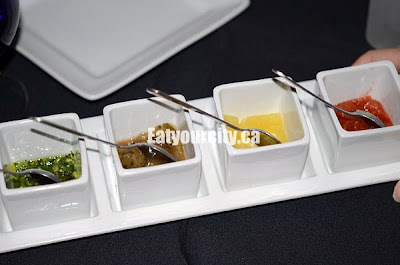 They still have a ways to go before they're as addicitive as Wild Tangerine's phyllo pastried shrimp pops. 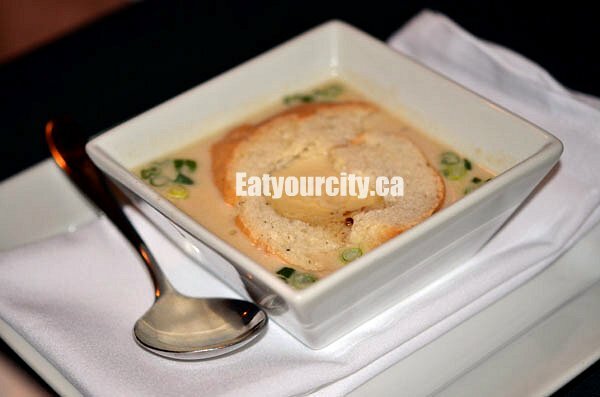 Chock full of clams and seafood, this rich and creamy soup topped with diced green onions and a toasted bit of bread that absorbed all the yumminess hit the spot on this cold winter night! 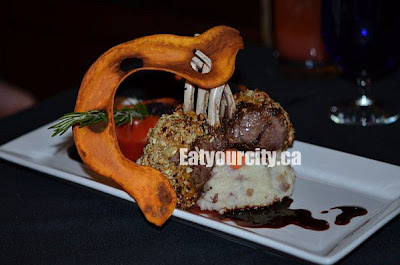 This rack of lamb was served a Salvador Dali-esque fried piece of yam threaded thru the tender medium rare lamb. The lamb was encrusted in a mixture of Dijon mustard & crushed pumpkin seeds and sat in a bed of sweet dark cherry and mint jus, and served with Von's creamy buttery red skin mashed potatoes, and some grilled sweet bell peppers. Nom! 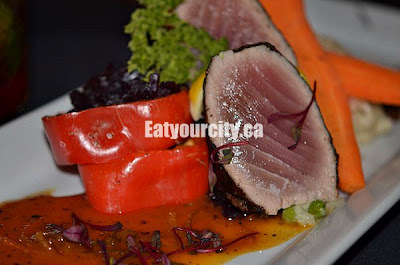 Wrapped in nori (seaweed), the cylinder of Ahi tuna is seared to a buttery rich rare, and served with a white miso, green tea and citrus reduction that tasted mainly of soy sauce. It was sitting on a bed of pickled ginger risotto which had a nice balance of rich creaminess and tartness from the pickled ginger. The grilled sweet red peppers and steamed carrots added in a bright note. The wasabi pea cracker was a bit odd (its the green lint like thing in the background) as it was a bit tough to bit into and not really crisp and quite bland. The tuna was definitely the star here! Rubbed in Dijon mustard, garlic and spices (black pepper!) before slow cooking it for 16 hours to a medium rare. Mmmm. Available in Regular cut 12oz, petite 8oz, Von's cut 17oz, Alberta cut 24oz, I think I ordered the nicely marbled regular cut as I love steak, but wanted to save room for dessert. And they cut me a piece from the centre so I was able to get my beef rare. 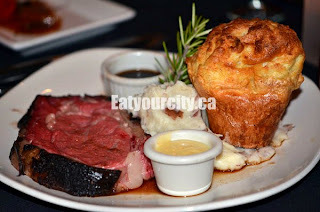 It comes with a warm fresh baked Yorkshire pudding (more like a dense croissant than a Yorkshire pudding), and a small pot of au jus as well as a pot of "atomic extra spicy" housemade horseradish. It also comes with a complimentary side, and I went with Von's buttery red mashed potatoes since I stole vegetables off other people's plates :P Pictured here is a side of Von's Oscar sauce - super creamy and rich crab meat and garlic cream sauce. Its normally served with another steak, but I love dunking the prime rib into the au jus followed by a silky bath of the Oscar sauce. Nom! Von's displays their in house made desserts menu on a dessert platter for those that want a more visual experience. Our waiter chuckles and tells us not to worry, our desserts won't be the one that have been been on display on the platter the whole night. 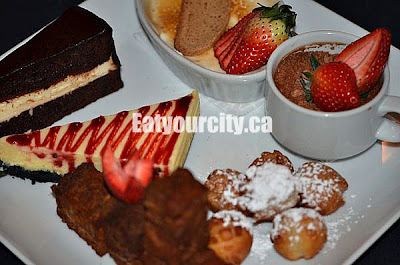 We have from the clockwise: Double chocolate cake, Marshmallow creme topped milky creme brulee, mini donuts served with chocolate moouse, housemade marshmallows dusted in dark cocoa (I think), and a raspberry white chocolate cheesecake. Most of were pretty full, so we ordered desserts to share. A layer of toasted melty marshmallow goo hides a layer of crisp burnt sugar. The milky custard tasted like a light malt, and I think there was a chocolate biscotti on the side. The toasted marshmallow topping was the best part! 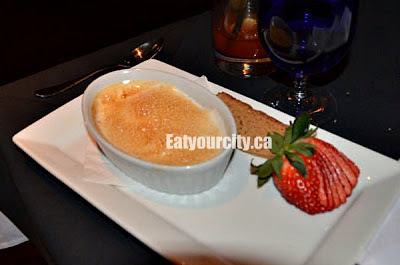 Perfect for sharing, this is one of my fav desserts from Von's. 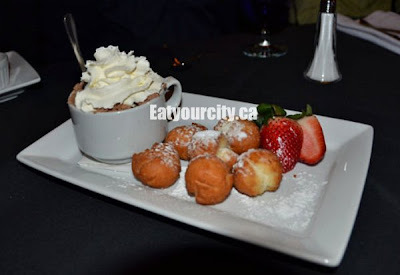 Dense mini donuts (not as fluffy soft as the ones at Capital Ex and Stampede) are finger scorching hot and dusted with powdered sugar. Once they cool done slightly, you can dunk them into a cup of chocolate moouse topped with sweetened whipped cream. The moouse was a bit too frozen, and was more like rich dark chocolate icecream (not a bad thing) - and became light and airy once it defrosted a bit. Mmmmm. Overall, yet another consistently tasty meal and desserts from Von's. Great for special occasions, with a bonus in that they can easily accommodate large groups.